Our garden is home to birds, bees and insects – all critters are welcome and part of the ecosystem. Our new insect hotel houses bugs that eat bugs, such as spiders that hunt moths, flies, mosquitoes and ants. Also insects that pollinate flowers – such as the solitary carpenter bee – are welcome to snuggle in. Our hotel offers all sorts of suites to choose from, each with a different bed filling with bark, straw or bamboo. Tiptoe closer and come peep carefully. You never know who’s moved in – moth, centipede, wasp or lizard? Or Sharks supporter? What a fabulous idea, and aesthetically pleasing too! Love the comment about the Sharks supporter…. What an original and responsible idea! Will promote it here (the Netherlands). We had ours made here on the farm. You’ll be able to find quite a few DIY designs online. 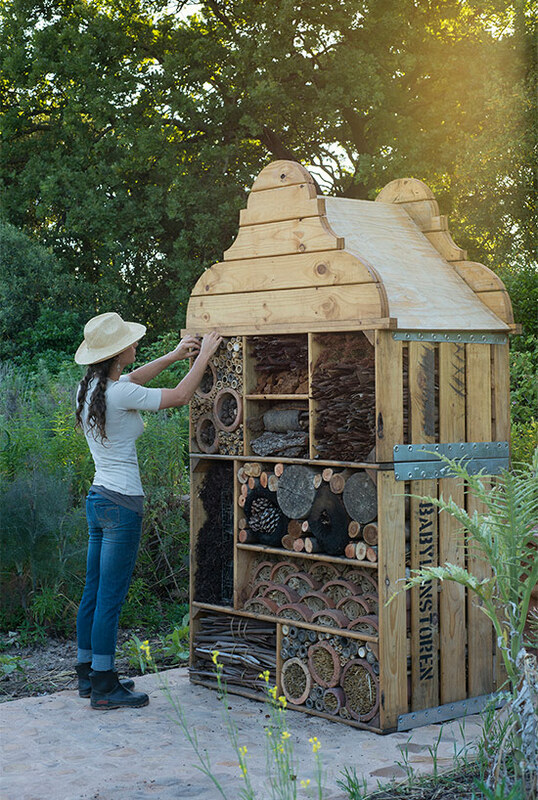 How about a workshop on building a bug house? I’d be v interested. Thoroughly enjoyed looking at your magnicicent bug hotel. We have native birds, butterflies (all varieties ), bees, bugs, spiders, etc in our garden in Victoria Australia.